Good Stuff NW: Artichokes: Bless Their Fuzzy Little Hearts! Artichokes are plentiful at the farmers' markets this time of year, so this recipe from contributor Jim Dixon of Real Good Food comes at the perfect moment. Oregon farmers grow great artichokes, and now is the time to eat them. I like the purple-tinged variety, especially when they’re very small and the fuzzy choke is minimal to non-existent. They still take a bit of prep, but the results are worth it. If you’ve never trimmed an artichoke, search Youtube and watch a couple of videos. [Here's a good one from Gourmet. - KAB] And keep your knife sharp. You'll need a dozen or more of the little ones for the recipe below. 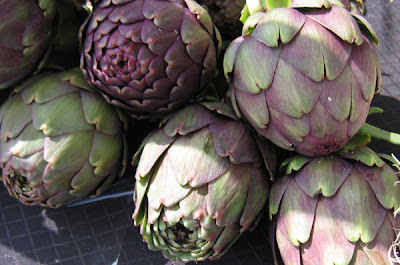 Carciofe is Italian for artichokes; Pantesco refers to the island of Pantelleria. I use it as shorthand for the delicious combination of Pantellerian capers and oregano with garlic and anchovy. Split the artichokes from top to bottom, cut off the upper two-thirds, pull off leaves until you get the really light-colored inner ones, and use the tip of your knife to dig out any fuzzy choke. Most recipes call for putting cut artichokes into acidulated water (lemon juice or vinegar added) to prevent browning, but they turn brown when you cook them anyway, so I skip this part. Put the trimmed artichokes halves cut side down in a heavy pan (one you can cover) with a enough extra virgin olive oil to cover the bottom. Add a few (2-4) of the best anchovies you can buy (these at Gustiamo are the best I’ve found and worth every penny; New Seasons carries oil-packed anchovies in jars from Sciacca, Sicily, home of Madre Terra), cleaned if salt packed, diced small. Toss in a few cloves of garlic, diced, a couple of tablespoons of the Pantellerian capers (rinsed of salt), and at least a tablespoon of the island’s oregano. Cook everything gently in the oil for 5 minutes, then add about a quarter cup of water, cover, and simmer for about 15 minutes or until the artichokes are tender. Good hot, better at room temp. 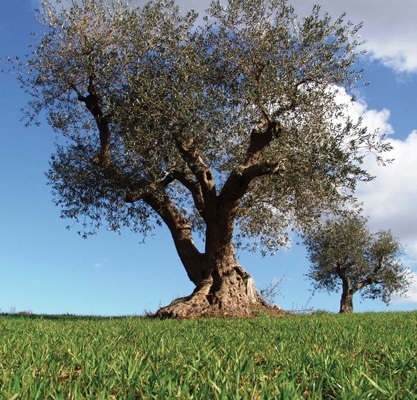 Come by from 5-7 pm, meet Brian & Cathy, and try Pascarosa extra virgin olive oil. Tom & Ani from AniChe Cellars will be sampling wine from the Columbia Gorge, and we’ll have some traditional Pugliese food. Details: Pascarosa Olive Oil Tasting with the Founders. Tues., May 28, 5-7 pm; free. 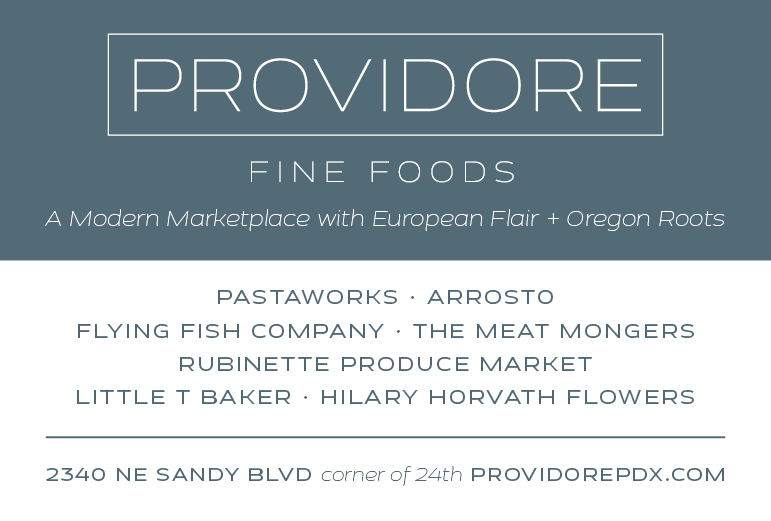 Real Good Food, 833 SE Main St., Suite 122, on the ground floor at the NE corner of the building.